We aren’t the only ones to have information about the CAT 6. Other places, in particular those who sell bats, usually have a boiler plate write up on the specs of a bat. Many of those we reference to make sure we are seeing what we should be. 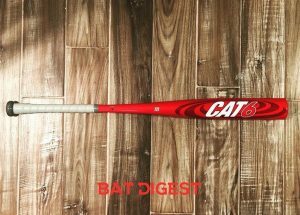 Here are some more references for the 2019 Marucci CAT 6 review. The CAT 6 has been one of the highest rated bats ever. It has great sizing options, feels great and prices right where most people want it to be. It has a middle of the road swing weight and uses the same proprietary knob found in new CAT bats from Marucci. As a general sentiment, we’d recommend the bat for any player that prefers the stiff feel of a single piece bat and is looking for a real value purchase. The sizing options at JustBats make it available for any player. The heavier the weight (drop 8, drop 5, BBCOR) the more we tend to prefer to the CAT 6. Hitters who like the honest feel and power that come from a one piece bat but also want to avoid its associated sting; Want a one piece bat; Prefer a balanced bat; Want a top shelf bat but don’t want to spend top shelf money; Prefer a two-piece bat but want to find a one-piece bat that swings with the same smoothness that two pieces do; would rather have an aluminum barrel. On the other hand, those who want an end loaded swing; are in little league and need a real light swing (as the CAT 6 is only in a max drop 8); are in little league and prefer a composite barrel. Overall the Original CAT 6 is, in justbatreviews opinion, the most beautiful BBCOR bat on the planet. The bat is sleek with a kissable and sheen finish. The angelic white with gray and red accents make it look like a bat designed in the halls of Prada. As per performance, we think the CAT 6 is a top shelf BBCOR bat that will perform, out of the wrapper, at the highest allowable .50 BBCOR standard. It’s big barrel (especially for a full piece aluminum bat) is remarkable. We are sure that those who fell in love with the CAT 5-Squared will fall in love all over again with the CAT 6. The Cat 6’s sting dampening knob makes it otherwise unique. No other bat uses such a tech (they can’t as Marucci has the patent). But, you can find some single piece aluminum bats from 2016 in the Omaha 516 and the Rawlings VELO. Both are legit choices, a bit ligther and also run a bit cheaper. For the CAT 6 Generation 2 you can find similar bats in, wait for it, the CAT 6 Gen 1. As well as bats like the 519 Omaha and 5150 from Rawlings. None of them have the technology in the knob or as big a barrel—but they also cost less. Another notable change to the bat is its design. The CAT 5-Squared was designed in gray backing with black and red highlights and a black grip. On the CAT 6, the bat is a very glossy pearl white with sort of hologram hurricane circles in the design. (Get it? CAT 6, Hurricane, as in a Category 6 Hurricane?). The grip is gray to match the highlights on the bat. On the BBCOR version of the bat Marucci also shaped the handle to transition into the knob. This larger widening handle increases the bottom hands contact to the bat which many hitters like. Those who like a skinny bottom hand handle can unwrap the tape and remove the plastic shaped cone on the bottom of the handle. The CAT 6 Generation 1 comes in a drop 3 BBCOR, Senior League (2 5/8 Barrel) of drop 5 and drop 8 and well as Junior Barrel Version (2 3/4) in a drop 10. The CAT 6 Generation 2 comes in all the same sizes as the Generation 1.